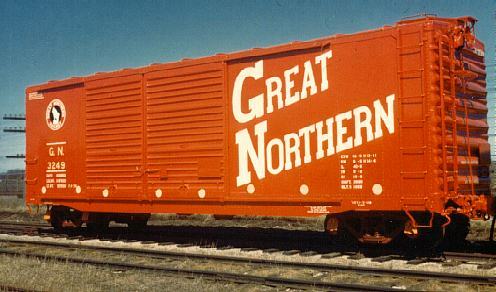 In 1956, the Great Northern painted up ten 40' boxcars in experimental paint schemes and sent them around the GN system for employee input. Some of the paint schemes were incredibly loud and garish (for the day), thus earning them the moniker, "Circus Cars". As you go through the 11 different photos, you will notice the GN adopted some of what appeared on these cars in future paint schemes. These 11 color photos originally were offered to GNRHS members many years ago and were quickly sold out. Fellow GNRHS member Chuck Place of Lake Lure, NC, USA was kind enough to loan me his set of prints long enough to scan them in for the GNR Page. Thank you, Chuck! 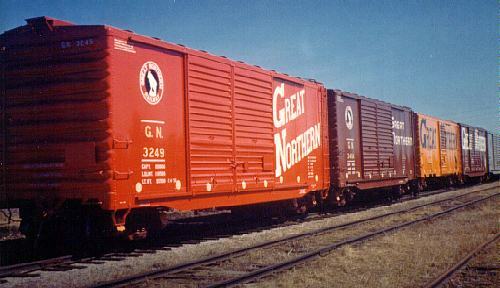 GN 3249 is a 40' double door boxcar painted Vermilion Red with white lettering and large, slanted Great Northern on the right side. The car has mineral red trucks with yellow journal covers and a small GN logo on the left side. 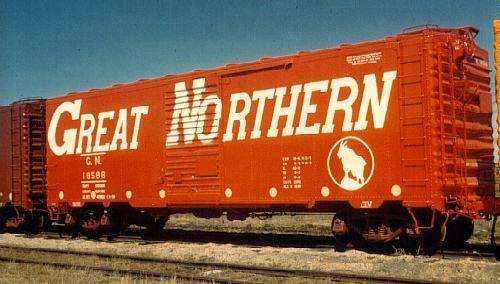 GN 3484 is a 40' double door boxcar painted Boxcar Brown with white lettering and large, Empire Builder-font Great Northern on the right side. The car has mineral red trucks with yellow journal covers and a small GN logo on the left side. GN 19038 is a 40' single door boxcar painted light (Omaha?) 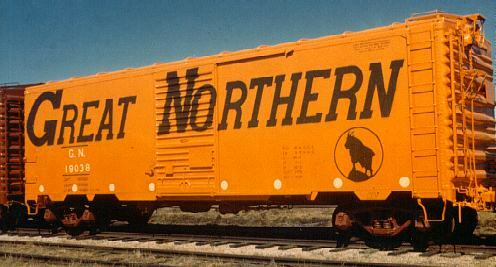 orange with Pullman green lettering (which looks black) and huge Great Northern spanning the length of the car (only the GN reporting marks and 19038 number are in white). The car has mineral red trucks and a medium GN logo on the right side. 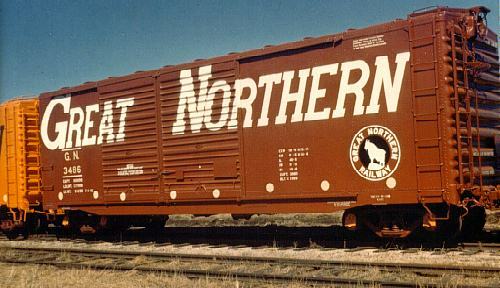 GN 3486 is a 40' double door boxcar painted Boxcar Brown with white lettering and a huge Great Northern spanning the length of the car. The car has mineral red trucks with yellow journal covers and a medium GN logo on the right side. 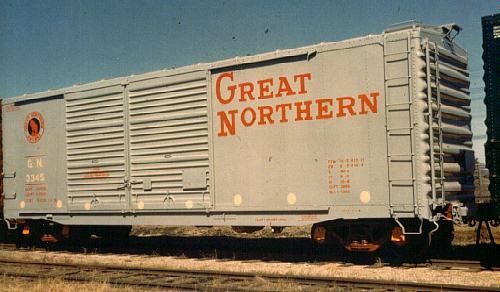 GN 3345 is a 40' double door boxcar painted light gray with orange lettering and medium, Great Northern on the right side. The car has mineral red trucks with yellow journal covers and a small GN logo on the left side. The GN 3345 reporting marks are white. 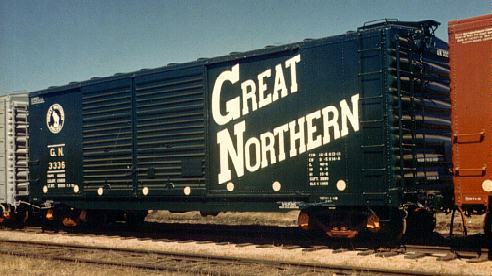 GN 3336 is a 40' double door boxcar painted Pullman Green (it looks black) with white lettering and large, slanted Great Northern on the right side. The car has mineral red trucks with yellow journal covers and a small GN logo on the left side. 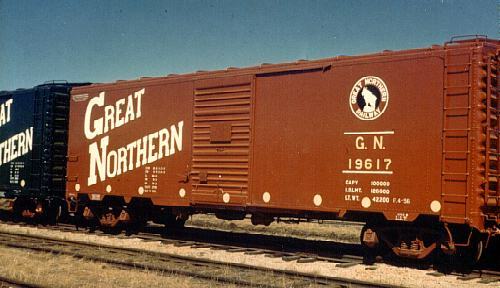 GN 19617 is a 40' single door boxcar painted Boxcar Brown with white lettering and large, slanted Great Northern on the left side. The car has mineral red trucks and a small GN logo on the right side. 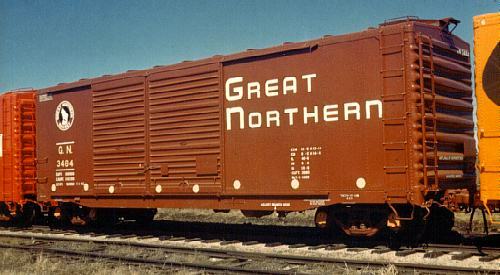 GN 18588 is a 40' single door boxcar painted dark orange with white lettering and huge Great Northern running the length of the car. The car has mineral red trucks and a medium GN logo on the right side. The GN 18588 reporting marks are painted yellow. 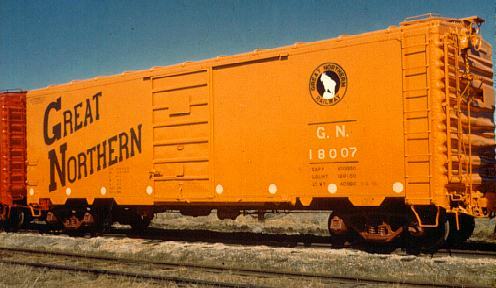 GN 18007 is a 40' single door boxcar painted light orange with Pullman green lettering (which looks black) and large, slanted Great Northern on the left side. The car has mineral red trucks and a small GN logo on the right side. The GN 18007 reporting marks are white. 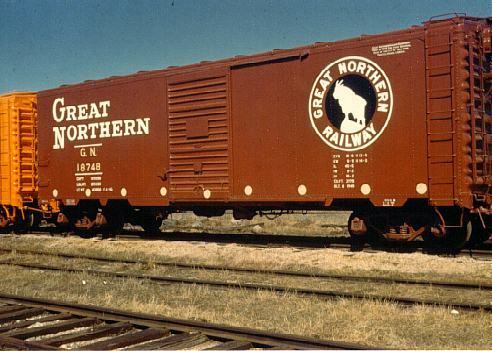 GN 18748 is a 40' single door boxcar painted Boxcar Brown with white lettering and large Great Northern on the left side. The car has mineral red trucks and a huge GN logo on the right side.